A week ago, I drove up to Santa Fe to join S.M. Stirling and eight other contributors to The Change: Tales of Downfall and Rebirth anthology for the release party at the Violet Crown Cinema in the historic railyard district. 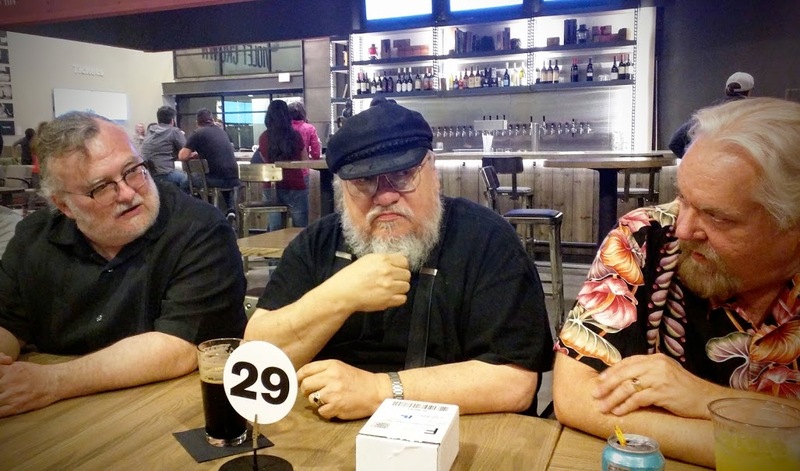 George R. R. Martin was our host, and he introduced Steve to an enthusiastic crowd, joking that he was confused as to why Steve chose to focus an anthology on menopause. He didn’t, of course. The Change was established in Stirling’s post-apocalyptic novel Dies the Fire, where all electronics, explosives, and internal combustion engines mysteriously cease working and humanity must find a way to survive. Since then, eleven other books have followed, some hitting the New York Times bestsellers’ list. Steve provides a great introduction to his world (and a tasty recipe!) in the Book Bites feature on Fran Wilde’s blog. The anthology is testament to the success of Stirling’s Emberverse novels and their enthusiastic fanbase, and Steve announced that if the anthology sells well, another one could be in the works. For The Change: Tales of Downfall and Rebirth, he asked his writing friends and colleagues to contribute stories. The Change anthology participants at the Violet Crown Cinema. S.M. Stirling fifth from left. Going from left to right, we’ll start with Diana Paxson. She flew in from California for the event, and Steve said her The Chronicles of Westria novels were a huge influence on him, so much so he’s named the Emberverse version of California Westria. Of course, that’s where she chose to set her story as well. Next is Kier Salmon, who since the beginning of this series has served as Steve’s Wiccan adviser, given the role of the religion in the books, and edits the Emberverse fan fiction site. She was able to adapt one of her beloved fan fiction pieces for the anthology. Jane Lindskold is a prominent New Mexican writer, currently with a science fiction series with Tor that starts with Artemis Awakening. Her story for the anthology is set in the Southwest, a part of the world that hasn’t really been explored in the Emberverse books. Similarly, Walter Jon Williams, another well-regarded New Mexico writer, chose a story setting that fell outside the reach of the books, a nautical tale rife with politics in post-Change Venice. He provides more context about his story in his blog post Time for a Change. Stirling, the central figure in the picture, chose to write a side story about the main character from The Golden Princess, book ten in the series. Next to him, Victor Milán, another New Mexican writer, whose Dinosaur Lords releases next month from Tor, chose to explore the post-Change environment in Mexico. And you can learn more about the inspiration for his story in the blog post The Change: Sandbox Play. John Jos. Miller, also based in New Mexico, long associated with the Wild Cards franchise as well as the comics and graphic novel industry, explored what happens to zoo animals and the humans still struggling to survive in post-Change Florida by updating the Tarzan trope. M. T. Reiten, a local author and finalist in the 2005 Writers of the Future Contest, used his doctorate in physics to explore what scientific principles had changed and what that actually meant for society in his story for the anthology. Emily Mah, also known as E. M. Tippets in romance circles, mined her LDS background to show how the Change affected a number college students at a faith-based college. Emily also has the honor of being tuckerized by Steve in the series. Finally there’s me on the right end if you squint! I’d been in a critique group with Stirling, Miller, Milán, Reiten, and Mah for about a year when Steve invited me to write a story for the anthology. I admit I was a little freaked out when that happened. It’s a huge honor to be asked, and it implies a lot of trust on his part in my abilities. And I almost said no, since I didn’t want to let him down with whatever story I came up with. But I couldn’t ignore the opportunity, so I wrote my story “Against the Wind,” sent it in to Steve, and was beyond thrilled when he accepted it. Needless to say, I’m grateful to Stirling for the opportunity to play in his world and that people seem to like the story so far! The Change: Tales of Downfall and Rebirth is a great introduction to Steve’s world or a nice companion to his novels, so please consider purchasing it from your local bookstore. If it continues to do well, there just might be another volume in the future! And if you live in New Mexico, join us at 4pm on Saturday, June 27th at Page1 Books in Albuquerque for another author event with Stirling showcasing the anthology! See you there! New Mexico Events for The Change Anthology Release!